Along with many others, I have long considered 8x32 power binoculars to be the best all round magnification for a general purpose binocular. Reasonably compact and lightweight with a 32 mm objective, they are the maximum powered field glass that can be held steadily enough, off hand (by most users) to provide a clear sight picture that takes full advantage of good quality optics, they also have a much wider field of view than say an 10x42 in the same class. Easily carried around the neck all day without becoming a pain, when they are not in use they conveniently tuck inside whatever clothing you are wearing. However, if you are a trophy hunter, instead of a meat hunter and prefer higher magnification glass in the 10x42 to12x50 range, read on. This manufacturer also has high quality roof prisms in those powers in this top of their line series. The main driving force behind the present wealth of quality binoculars today and across the board bino improvements in their performance, are the birdwatching fraternity, who insist on accurate colour rendition and a bright, sharp and contrasty image with a waterproof and robust construction. Statistics show that 60% of the total customers buying binoculars in the 8 to 10 power range are birdwatchers. Of course as shooters and hunters we also gain from the fore mentioned improvements, driven by this fiercely competitive market area. To be candid, a pair of 8x32 porroprism binos costing around NZ$250 would be adequate for most hunting purposes and many hunters are perfectly happy with that. However, budgets and tastes differ, and other hunters would not be satisfied with less than the best money can buy. And then there is the midrange group where high quality products at good prices abound, all aimed at those fussy birdwatchers. 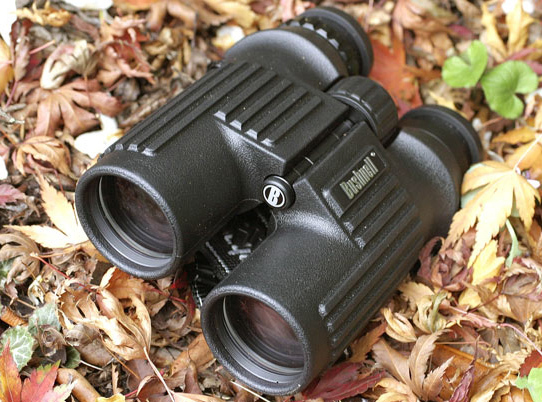 Recently, I was pleased to receive a courier package from Nic Burgess at Ampro Sales Ltd, the New Zealand Bushnell agents, containing a pair of Bushnell Legend 8x42 roof prism binoculars. The Legend series is the top of the line of the Bushnell birding/ outdoor/hunting binocular products. Bushnell, being a patriotic U.S. company, most measurements provided are in pounds and inches. I was interested to see how glasses weighing 30.1 ounces performed and if the extra weight was worth toting. At some 9 ounces heavier and a little bulkier than most 8x32s, these 8x42 are the same dimensions as many 10x42s. On opening the package and handling the glasses the first impression was of solid construction and good ergonomic design. The barrels are covered in a black rubberised armour material to absorb bumps and dings. Mossy Oak camo is also available on the 8x42 and 10x42 Legends. The hinge in the bridge is substantial and smooth to operate. The focus wheel is well located at the rear of the bridge and of a good size, with indentations to make it easier to turn; it is also very smooth to adjust with no slack in any direction and easily operated with one finger. The gearing of this wheel is good for hunting use with only small adjustments required to change focus from near to far. The diopter setting ring on the right hand barrel rear is also substantial, with deep knurling to assist adjustment. It is stiff to turn but smooth so will not easily be bumped out of alignment once set to the owner's satisfaction. The eyecups are of the twist up style now adopted by almost every manufacturer, and once set lock firmly into place. They can be left in the down position to give eyeglass wearers a full field of view. The front objectives have a nice green tinted multicoating and are well recessed to protect the elements. All lens surfaces, external and internal are fully multicoated to aid light transmission. One thing that I have reservations about is the propensity of binocular manufacturers, and Bushnell is no exception, to put "speed bumps" at the rear end of the main tubes which they claim is an ergonomic advantage. All this does in my opinion is increase the rear diameter of the binos and creates a sharpish edge to dig into you should you, like me; prefer to carry the uncased glasses inside your shirt. The bumps may not fit everybody's grip either, so it is important to try various binoculars for fit to your face, before you buy. In my case, with a wide bridge to my nose, the diopter adjustment ring on the 8x42 Legends pressed uncomfortably into this area. I did however give several of my friends the opportunity to try them out and enquired if they were affected in the same way, "Not at all" was the consensus. Standard size, centre focus roof prism, Bak 4 (crown barium glass prisms) PC3 phase coated to increase contrast and resolution, fully multicoated on all lens surfaces for optimum light transmission. Bushnell patented rainguard moisture repellent treatment on front and rear elements. Field of view, 330 ft @ 1000yds (110 metres at 1000 metres) Close focus 6ft (1.8 metres) Exit pupil, a bright 5.5, Eye relief 18mm, Water proof and fog proof. The binos are O ring sealed and nitrogen purged so would remain waterproof under all practical usage. They also come with a neckstrap, protective carry case and lens cleaning cloth plus front and rear lens cap covers. The limited lifetime guarantee is for the lifetime of the original owner and proof of purchase is required to activate the warranty. The Bushnell 8x42 Legends are manufactured in Japan. For a comparison and as a control I used a pair of 8x32 Minox binoculars. German made in Wetzlar, and from a respected optics manufacturer, these are also in the midrange price bracket, but at the upper end. The Minox cost NZ $1300 to purchase new and set a high standard to judge the Bushnell product against. First I sprayed the rear and front elements on both pairs with a plant sprayer filled with water as a test for the "Rainguard" coating. The Bushnells still maintained a high degree of visibility although globules of water obstructed the elements. The Minox where still useable for a while to a lesser degree until the outer surface of the eyepiece elements fogged over. I have established a basic test routine, the first part which involves a practical resolution, contrast, colour rendition and brightness test. I have a TV repeater station on a ridge about two miles from my house. I do the same check in bright sun, overcast cloud and evening light. Setting up a sandbag on the roof of my car I focus both pairs of binos on the station and compare what I can see. The resolution of the Bushnells matched the Minox in resolving the power lines on the poles running down that ridge, contrast was very similar, as was colour rendition (accurate!) The Minox's view appeared slightly brighter. The next step involves an Edwards USAF resolution chart set up at 30 meters and not in direct sunlight, with the both pairs of binos on the roof of the car on the sandbag again. Both pairs read pattern lines down to just over 1 mm at thirty metres (very good!). The on axis (centre sharpness) and off axis resolution (edge sharpness) of the Bushnell's was also excellent with minimal coma distortion at the edges and a flat field with a little pincushion distortion apparent. While chromatic aberration (colour fringing) was apparent if looked carefully for in conducive conditions (branches against the sky etc) it was not strong enough to be a concern. I then took both pairs for an evening stroll to see how they perform in fading light. All binoculars need some light to work and even low light binos only extend the viewing time or distance for mere minutes or metres as hunting optics. I have a council walkway not to far from home that is a good place for this part of the evaluation , low contrast dry brown grass with open scrub and then a thick belt of trees with open cover underneath, running up a wide valley. As expected the Bushnell's with their 10mm wider objective lense's gained about 3 minutes more usage in fading light, they also had good penetration in the open cover under the trees earlier in the evening and would have easily picked up any animal lurking there. I did take the Bushnell Legends out to The Vernon Station on a rabbit assassination assignment one lovely autumn afternoon. Sitting still, the little herbivores blend in well with the dry grey earth and tussock which makes them very hard to spot. In these conditions a sharp contrasty binoculars are needed. It is open country and the rabbits know I am not there in their interests; they will either bolt over the nearest ridge when they spot me from a long way off, or just sit quiet and hope I pass them by. I did manage to locate and reduce the population of "herbies" by eight that afternoon and some were a little distance out, too. I found the binos comfortable and easy to use and not heavy enough to be a problem. They picked out the rabbits clear and sharp and also allowed me to see the buildings on the hills, 25 miles away across the straight in the approaches to Wellington Harbour. The Bushnells offer good handling and are well constructed, with smooth precise adjustments. The lense's are nicely recessed and the binos do the job they are designed to do with aplomb. They definitely are in the same league as the Minox they were compared to, and at NZ$899 are competitively priced. If you are in the market for some high quality and sharply priced mid range binos, give the Legend series Bushnell's serious consideration. Copyright 2005, 2013 by Erin Boyd and/or chuckhawks.com. All rights reserved.